What is it A complex space combat RTS with a great space opera story. 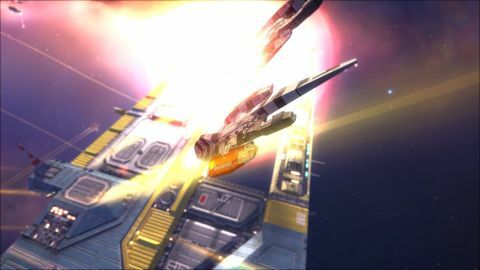 It's odd that one of the best space operas on PC should be a real time strategy game, but that's the magic of Homeworld. More than 15 years after its original release, Gearbox have remastered Relic's opus and its sequel with high-res textures, fancy lighting and a new UI, successfully modernising one of the most challenging and evocative strategy series ever made. It's a thing of beauty, especially if you have an affinity for spaceships doing spaceship things, like shedding squadrons of attack craft and shooting giant lasers across the void. But Homeworld's beauty runs deeper. It's in the sound design—the stirring use of Adagio for Strings; the curt, lonely comms from your captains; and the way Homeworld's three-dimensional warfare simulates loss and attrition across its campaigns. Both are stories of survival among the stars. Your species' last hope is a giant boomerang called the Pride of Hiigara, a colossal mothership with the means to create an economy of smaller ships, from tiny mining vessels to bombers and attack craft. The Pride's ability to create armies makes her your primary offensive tool, but that elegant arced carapace protects the cryogenically frozen remnants of your species. Her loss means total defeat. Homeworld cleverly plays on this tension. One early mission has you rescuing slabs of stasis-bound citizens from raiders. Your ship's computer announces “100,000 saved” with each rescue, attaching a haunting death toll the vessels the raiders inevitably scuttle. Military units and civilians you preserve are carried through from mission to mission as you nurture your giant space family and bring your species back from the brink of total disaster. The fleet's transition from refugee rabble to military tempest is artfully paced, and the campaign stands today as the most effective use of the RTS as a storytelling tool. It's challenging, however, and often fiddly. Micromanaging troops across vast distances in a 3D environment takes practice and judicious use of the pause key. Expect to spend lots of time separating your forces into control groups and sending them after specific targets – fighter units, or the subsystems of some huge dreadnought. Ships are loosely grouped into anti-fighter and anti-capital classes, but their size, relative speed and the upgrades you choose to research vary their roles significantly. There's a lot to learn, and missions hammer you with unexpected objectives. It's common to be managing several combats at the same time, all while maintaining an economy and keeping your build queues busy. It's overwhelming, and deliberately so. Campaign missions can become very difficult if you fail to preserve forces between missions and the technicalities of combat—like micromanaging units to attack the softer top armour of frigates—becomes arduous in Homeworld's biggest scraps. The steep learning curve is entirely worth the effort, though, for the fantasy of commanding such an extraordinary collection of sleek, glowing vehicles, and for the spectacle when they boost into battle. That's helped by Gearbox' outstanding update work. They've recreated Homeworld's ageing backgrounds and ship textures in keeping with Relic's original vision. Lasers cast light on vessels, a depth of field effect enhances the already well-developed sense of distance between craft and the updated UI makes cycling between factory units easier. Only a few minor problems interfere, like the abstraction of ship classes to arbitrary geometric shapes in menus, but they're meagre quibbles given the quality of the package. Homeworld is simply incredible and everyone should play it.